The Avengers: Age of Ultron sets the stage for “Phase 3” at Marvel, the next slate of nine films planned for release, which includes the newest installments of the Captain America, Guardians, Thor, and Avengers franchises, in addition to a few new faces, such as Black Panther, Doctor Strange, and the Inhumans. Even with careful planning, filmmaking is an uncertain business. Feige stressed the importance of flexibility both in being able to adjust to necessary change and recognizing when change is for the better. 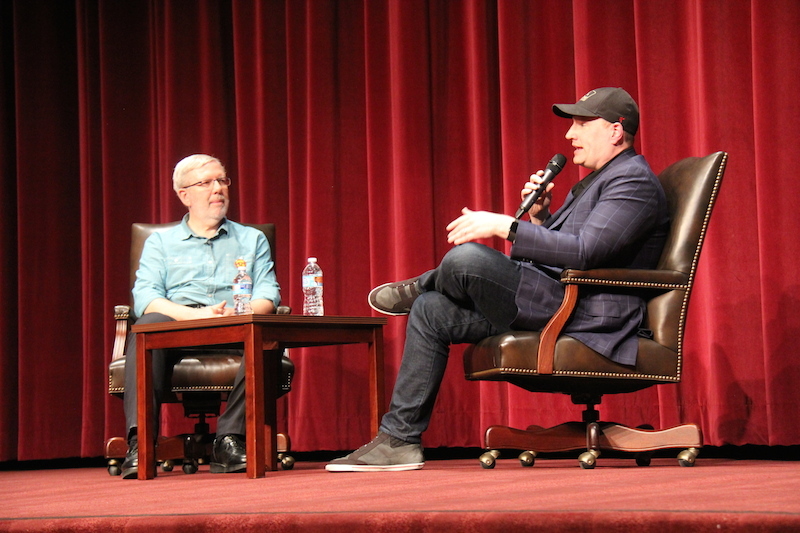 “We change things every day when new ideas come along and better ideas come along, or when an idea in a movie that is currently filming will somewhat impact a movie that’s still in development,” he explained to the packed crowd at Norris Theater. Those considerations are especially important, given Feige’s bold and unconventional choice of making sure that the MCU is consistent and logical across each branch of its sprawling and varied franchises. Such is the scope of Feige’s ambition at Marvel. His films have changed the expectations set for “comic book movies” both in the U.S. and abroad. Globally, The Avengers: Age of Ultron has already hit $626.7M in box office sales. Like the success of Marvel itself, its heroes are also not content to only dominate in the states.